There have been a few items that have brought me pure joy during the month of April. Here they are! During my trip to California with Trey in March, one of my must-sees was eco-beauty Mecca, Detox Market. That's where I procured this little glass jar of joy. After what felt like a very long winter, I'd been struggling with undereye darkness. I do have a few eye products that are nice and hydrating, but I find them to be too oily for daytime wear. The SkinOwl Eye+ is different. It's an aloe-based gel so it's not greasy at all, and absorbs into the skin quite nicely. It leaves a light residue with a satin finish - perfect for applying makeup over. I've been using it almost daily since I got it and have been pleased with the experience and results! Definitely a new favorite. This hair oil is another souvenir from my Cali vacay, acquired at Credo Beauty. I was specifically looking for a hair oil because I'd almost run out of the lovely one I'd gotten in Croatia last year. I've eliminated sulfates and other nasties from my hair-care routine, and usually wash my hair every other day or less. Still, I do have dry scalp issues during the winter months. I had my eye on another hair oil, but it cost nearly twice the price of this one for just one ounce! This bottle has a very generous 4 ounces, which is sure to last me a very long time. The scent profile is just to-die-for. It's an earthy minty refreshing delight - peppermint with notes of lavender, palo santo, and rosemary. My favorite way to use it is to massage it into my scalp, brush my hair, and tie it up into a bun before I hit the treadmill in the morning. That way it has time to work its magic before I wash it out in the shower. I've been hearing & reading really wonderful reviews of this mask since it was first released as part of Mahalo's limited edition 2016 Valentine's gift set. I was hoping that Mahalo would do a similar gift set this year, so I set aside some funds, just in case. To my delight, the limited edition "Love + Collection" was released in February and I nabbed one right away! The collection, which includes a full size jar of The Bean mask, as well as a serum, toner, and balm, was a great value. I enjoy all of the products well enough, but it's The Bean that I've really fallen in love with. The experience of applying and wearing the mask is decadent. It features cacao, coffee, and vanilla, so of course it smells absolutely delicious. The results are just as pleasant. After I use The Bean, my skin looks refreshed and moisturized, and feels surprisingly soft. I find that I look a bit flushed after I wash it off, evidence that the mask does indeed boost circulation and blood flow to the skin. The Bean is now part of Mahalo's permanent collection, and thank goodness for that, because I will certainly buy it again! I have a smoothie for breakfast almost every single day. I avoid dairy and soy, so almond has been my milk of choice for some time now. I knew that making my own almond milk would probably save me some money, but it seemed like a hassle so I put off trying it. For that, I have nothing but regret! The process couldn't be simpler - you just soak, blend, strain. Seriously what the hell was I waiting for?!? I get sick thinking about the amount of money I wasted - and of course the amount of plastic bottles that wound up in our recycling bin! UGH! Not to mention all the additives and preservatives found in store-bought nut milks. What was I thinking? Why did I wait so long?! Don't make the mistake I made. I have been making at least one batch of nut milk a week, using this recipe from Tasty-Yummies. I put the leftover pulp into the dehydrator and, viola! free almond flour! That saves me another ten bucks a week! For my first couple of batches, I used some cheesecloth that I already had, but then decided to go ahead and order myself a couple of nut bags. (Get a good laugh. I certainly did.) Be sure to use organic nut bags made of natural materials instead of plastic. I picked up this duo, which includes one cotton bag, and one hemp bag. Both have yielded great results for me. I like having two in case I forget to wash one, so I have a second one ready to go! I've been following adoredvintage's ABSOLUTELY STUNNING Instagram account for some time now. 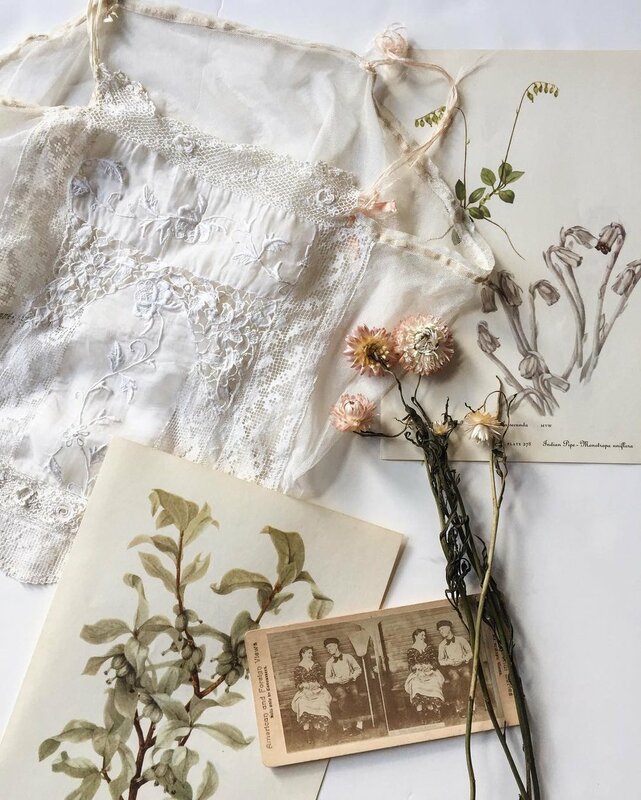 Rodellee curates the most beautiful selection of vintage clothing, and her ethereal photography makes me want to fill my wardrobe with antique pieces that I can wear to wander through Edwardian gardens. 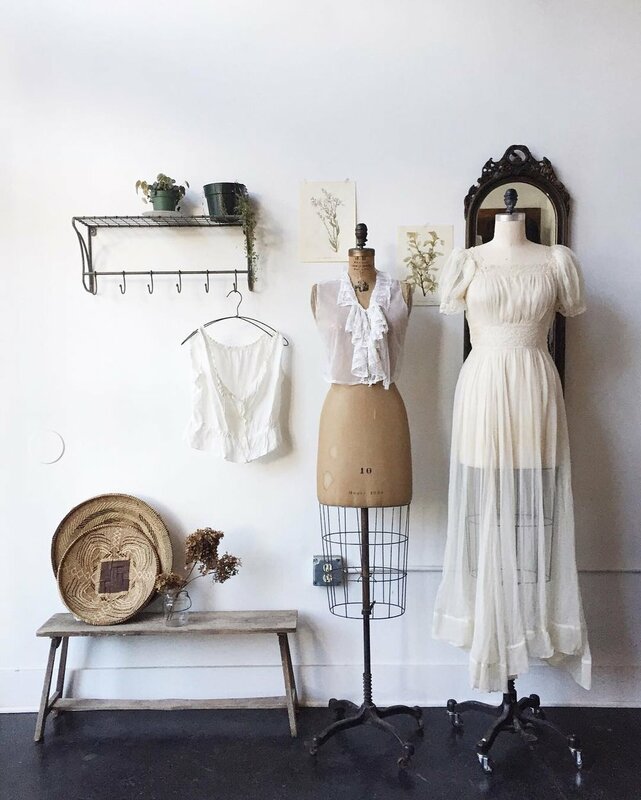 She also carries some "vintage-inspired" pieces, and when I saw the the Bennet Dress on her Instagram stories, I fell head over heels in love with it. I especially love that it's made in the USA! I expect to wear this beauty all summer long. Since discovering that I have polycystic ovaries, I've been doing lots and lots of research, reading, and experimenting with diets and supplements. I'd heard about Thrive Market in the past and decided that now was a good time to try it out. Thrive Market is a membership-based online retailer that sells organic, earth friendly products. This is the kind of stuff that you would find in the health food or organic section of your grocery market, but usually at much lower cost. Plus, a lot of stuff that you CAN'T find at your local grocer. I've used it to purchase supplements, teas, adaptogens, and specialty pantry items, and I've been quite impressed so far. The quality and selection of items is great, and the prices are surprisingly low. I couldn't believe how affordable even high end brands like Sun Potions are on Thrive! I've even used it to pick up things like dish soap, treats and supplements for the pets, and haircare. There's almost always a deal to get at least one full-size product for free with your order. You can use the link below to get a free trial membership, so you can explore everything they offer for yourself. I highly recommend trying it out! CLICK HERE to get one month of free membership, 15% off your first order, and free shipping! Ok this one may seem like a generic cop-out, but I swear it isn't. If you follow me on Instagram, you already know that gardening is something I've enjoyed every month, for more than ten years now. I'm constantly posting photos from my garden, and stories about all the plants in my life. Recently, though, it has become more than just a hobby for me. Lately, it seems that everyone is going on and on about meditation, and wellness rituals, and crystals, and spiritual cleansing, and I want to benefit from all of it. But try as I might - I just can't get into it. I've downloaded several meditation apps, and even taken the time to sit and breathe and "still my mind" as instructed. I've purchased crystals, and palo santo incense to "cleanse them" with. I've sipped lemon water in silence in the mornings. But none of it has effected me the way I've hoped it would. It doesn't clear my mind, or leave me feeling refreshed, focused, and ready to take on new tasks. Then, in the beginning of April, it was time for me to plant my seeds for the year. I spent an afternoon planting 90 little cups of around 37 different varieties of vegetables, herbs, and flowers. I've spent some portion of every day since tending to them, watering them, fertilizing them, rotating them, adjusting the lights. And some additional time in the garden sowing even more seeds into the earth, pulling weeds, readying trellises, and raking compost. Then suddenly, there it was: that sense of calm, and of focus that I had been hoping for. And it hit me! Gardening is my own version of a wellness ritual and meditation. Gardening is a practice in patience, because though I usually go after instant gratification, I have to wait months to reap what I've sown. Gardening is a practice in mindfulness, because when I'm thinning seedlings or pulling weeds, my mind can't be anywhere else. Gardening is a practice in gratitude, because what I've grow provides beauty, and nourishment. Gardening is a practice in letting go, because at the end of every season I lose the thing that I've sacrificed my time and energy for. 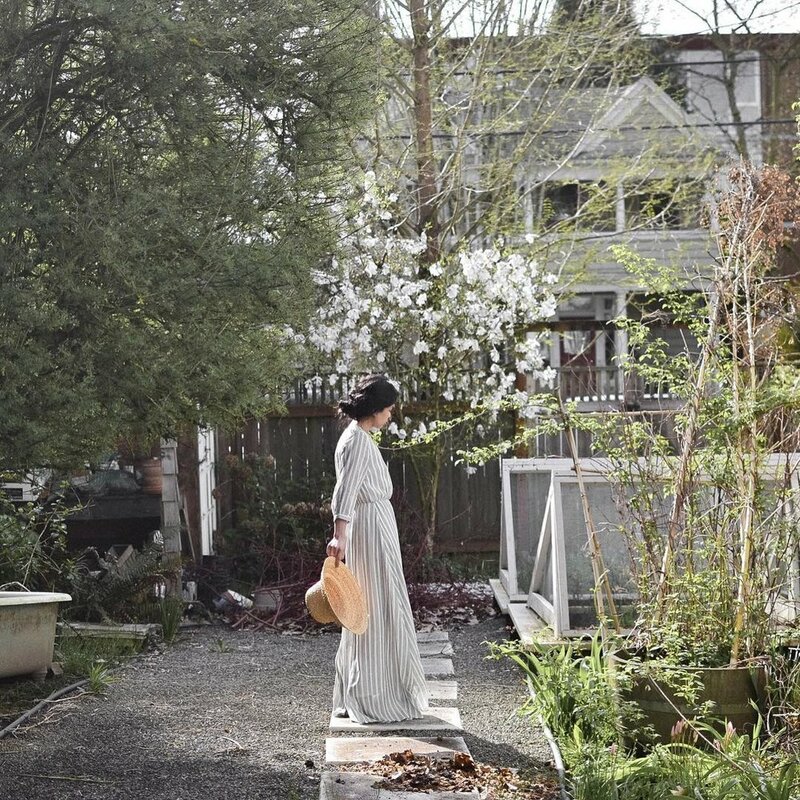 Gardening is even a practice in spirituality, because you can't possibly be a successful gardener without realizing that everything is connected, and cyclical. So while it has been part of my life for many years, gardening was most definitely my favorite thing in April. Click here for a word about consumerism, and why you should NOT buy this stuff!